Traditional fish and chips will never go out of fashion. This is a fact. So, when another fish and chips joint opened at Straits Quay, many flock to it. Including us. 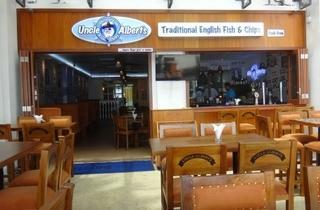 So, how does Uncle Albert's version stand our fish and chips test, you ask? They score high with their thin, crispy batter but a little low on their prices and homemade chips. 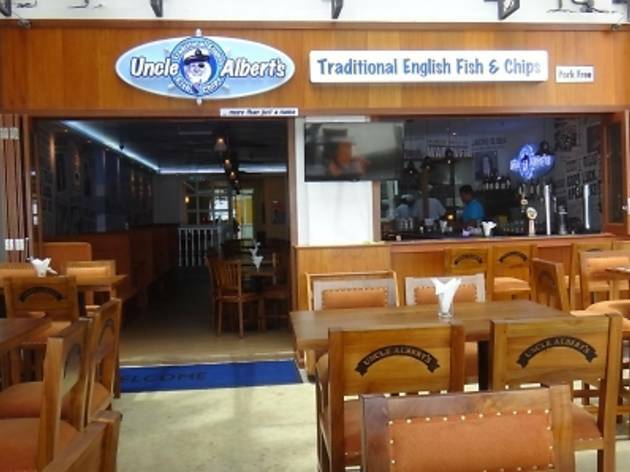 Their fish and chips menu consists of salmon, monkfish, halibut, cod and haddock. You can choose your fish choice to be either grilled, baked and herb crusted or coated in their secret batter and deep-fried from RM42 and right now, as an opening promotion, each serving comes with a bowl of soup along with a large piece of bread and butter. We choose the batter-coated, deep fried halibut that comes with homemade chips and mushy peas. Undeniably, it’s the best batter we’ve had. Light, fresh, thoroughly crispy and with absolutely no floury-moments, it certainly redeems the flimsy flavour of the halibut with a lovely crunch at each bite. The mushy peas with sprinkles of chopped mint leaves is simultaneously refreshing and comforting while cleverly cutting down the oiliness of the batter. Carbohydrate wise, we prefer the side order of French fries at RM12 rather than the lightly batter-coated homemade chips that come with our order that are of a generous portion, a little on the sweet side and hold a mild crunch. All in all, our order is a good-sized portion and their tartar sauce is lovely. If fish is not your cuppa tea, their menu extends to roast chicken, beef burger and beef lasagne, while for seafood variety, there’s fisherman’s pie, spicy prawns and creamy salmon pasta from RM25. Fizzy drinks are from RM10, beers are from RM12 and wine is at RM20 per glass.